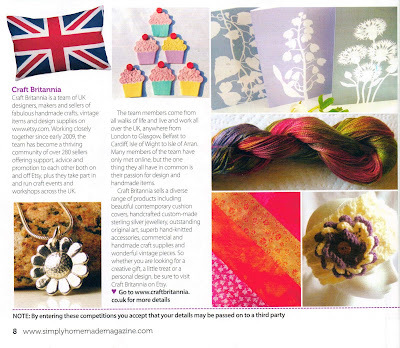 Have you heard about Craft Britannia yet? We are a wonderfully creative, diverse and supportive group of artists and crafters from all over the British Isles, and between us we represent just about every craft you can think of! But one of the things we all have in common (apart from being passionate about what we make and how we make it) is that we all sell our work on Etsy. 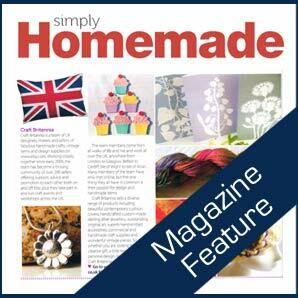 A selection of the beautiful creations made by members of the team has been published in Issue 4 of Simply Homemade magazine, and the article includes a photo of my little fine silver Daisy Pendant! Read more about the team on the Craft Britannia website, or check out the Craft Britannia Summer Style Guide for full details about each of the items featured. Thank you very much VeeDubz and Simply Homemade! Very cool - well done! I am also a UK crafter that sells on Etsy - thank you for sharing Craft Britannia and Simply Homemade. nice feature on the team & with your pretty necklace too! Wow, that's great congrats Erika!!! Well done! Yay for team work! Aw its lovely to see fellow team mates work in a magazine.